I didn't love this one. My feelings about this book are actually pretty mixed. I didn't hate it but I am not really sure that I liked it either. I requested this book on NetGalley when it was listed as Can You Keep a Secret? without any details. I am a curious person by nature and I just had to know about this book that was so exciting it had to be kept secret. I don't think I would have asked for this book if I had known what the actual description was. The story opens at the funeral for Caro and Stephanie's stepmother. After the funeral, the estate needs to be settled and Caro needs a place to live so she goes to the house to sort through things. It becomes obvious almost immediately that the people in the small town her stepmother lived in do not think much of Caro. The only person that shows any kindness to Caro is the man living in the cottage on the land her stepmother's home is on, Craig. I found the bulk of the book to be really slow. There is a whole lot of action crammed into the last part of the book but for most of the book, it didn't feel like a whole lot happened. We spend a lot of time in Caro's head thinking about all the things she doesn't know and I hate to that it got old pretty fast. I did wonder if Caro would prove to be an unreliable narrator simply because she seemed so clueless about so many things. There were things that I did like about the book. Once all of the pieces came together near the end, I did find the book to be much more exciting. There were quite a few surprises that were revealed during the book's finale. I also liked the parts of the fairy tales that were worked into the story. I was really pretty interested in the story of the pear drum specifically. I think that a lot of readers might like this book more than I did. I didn't hate this book but it failed to completely grab me. While I found this book easy to set aside at times, I was curious enough about how everything would work out to keep me reading until the very end and I was satisfied with its conclusion. 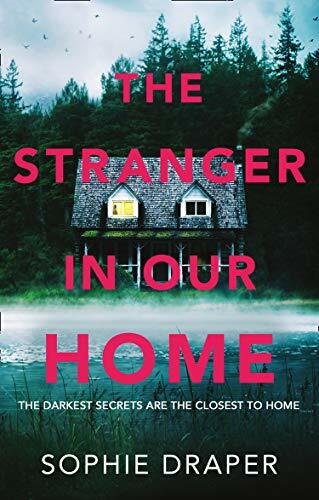 I received a digital review copy of this book from Avon Books UK via NetGalley. Sophie Draper is a Derbyshire based author. Cuckoo is her first book and won the Bath Novel Award 2017. She also won the York Festival of Writing Friday Night Live Award 2017. A second book is due to be published later in 2019. I don't understand why the covers and titles are so different. 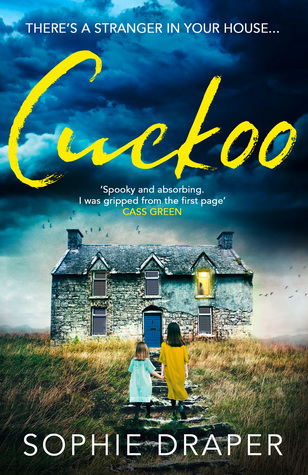 I do like the cover for Cuckoo much better. I am sorry this didn't work for you. Sometime the title sounds exciting but the story fall to live up to it. It did have some good moments so it worked out. There's nothing worse than not loving the book! I find thrillers can be pretty hit and miss! This was just kind of meh for me. I like the cover you featured much more than the US version. I don't know if I'll pick this one up but if I see it at the library, I might give it a shot. I hope you like it if you do give it a try, Barb! Sorry to learn Cuckoo didn't work out so well for you. I wonder if an even pace throughout might have made it a more engaging read? It's too bad the pacing of this book wasn't steady throughout instead of all thrown into the end. Better luck with your next read! Not every book works or every reader. The ending really was the highlight for me. Probably not the book for me. I don't like when a story is slow. I get bored. It was too slow for my tastes. That's too bad this book is slow. The story definitely sounds like it has potential. I don't mind a slower pace if the story is atmospheric and suspenseful enough. This is one I'd try if it came up on my library's audio site but I don't think I'll go out of my way. I hope you like it a bit more than I did if you give it a try. I noticed a lot of readers did enjoy it. I don't mind taking chances but I don't know that I want to request a book on NetGalley again without any information since I feel like I have to read those. It's not like I have a shortage of reading material or anything.